Why Does the World Cup Matter So Much? It is indeed, only a game. However, it is a game that an estimated 3.6 billion viewers will tune in to this time around, up from 3.2 billion in 2010 – that, by the way, is about 51% of the global population. Which begs the question: what is the other 49% doing? In North America, it begs another question: Why does the World Cup matter so much? Why does absolutely nothing match the passion for the beautiful game? My encounter with the sad Greek friend, I believe, has a lot to do with it. Football (or as Americans call it soccer, ugh) is the most played and watched spectacle on earth; and the World Cup of football is the single-most momentous global event, period. Some might argue that the Olympics should be since more countries are generally represented. But I ask you, do you notice a sea of nation’s flags during the Olympics? Not likely. The street-side flag merchants feverishly sell their wares only when the World Cup comes around, and to a lesser extent the Euro (The European Football Championship). Why do you think this is? Here it is, in a nutshell. In Canada, during the Olympics, people generally cheer for Canada. We are fairly interested in how well our country, or adopted nation, is doing. During this time, we are all Canadian. Also, people are watching events they only care about once every four years. But when you talk about the World Cup, there’s a greater fascination with it because more people around the world watch football every week of every month of every year. When the big tournament finally rolls around, people begin to identify with their country of origin, a nationalistic fever rises up. Ethnic groups that were proud to cheer for Canada during the Olympics, suddenly discover their roots. Furthermore, even if your nation did not make it through the grueling 2 year World Cup qualification period, you will find a country to raise your voice for. That is the magic of football. It unites us all, under the umbrella of a global spectacle. 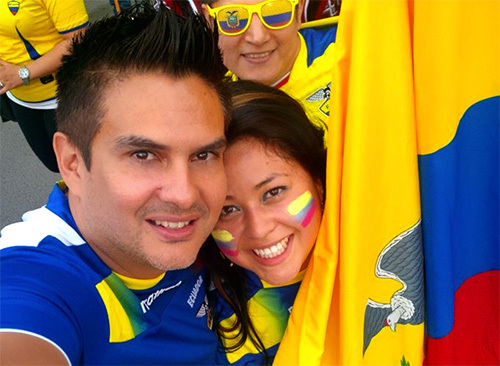 I was lucky enough to see Ecuador make it into the World Cup this time around, in a tough group, no less. But for 2 weeks, I was Ecuadorian, and staunchly so. That’s right; I was out on the street, waving my flag, in my nation’s jersey, shoulder to shoulder with other compatriots when they defeated Honduras. Then, I was proportionately devastated when they could not score just one more goal against the mighty French to see themselves through to the next round. These emotions are unmatched. It is a frenzy that spreads across all borders. When your team is eliminated, as undoubtedly most are, you simply lick your wounds and continue to cheer the spectacle. Why? Because as cliché as it sounds, football is more than just a sport. For 51% of humanity it is the ultimate cultural expression. When you see TV coverage of stadia, bars, streets and homes all around the world, you see women, men, children, grandparents, people from all walks of life, uniting to express their cultural pride for their colors. Cars honk to acknowledge your allegiance, people give you high fives in the supermarket when they see you in your nation’s jersey, and people share your pain walking down the street when your colours are defeated – the ultimate cultural expression. Football is also a language of its own. You can drop a ball between two people anywhere in the world, and they know what to do. I’ve actually experienced this unique pleasure when I travelled through Europe. Wherever I visited, I picked up a little football souvenir and on several occasions, kicked it around in airports and train stations with people I had never met in my life, regardless of the fact that we did not share a language. That is powerful. 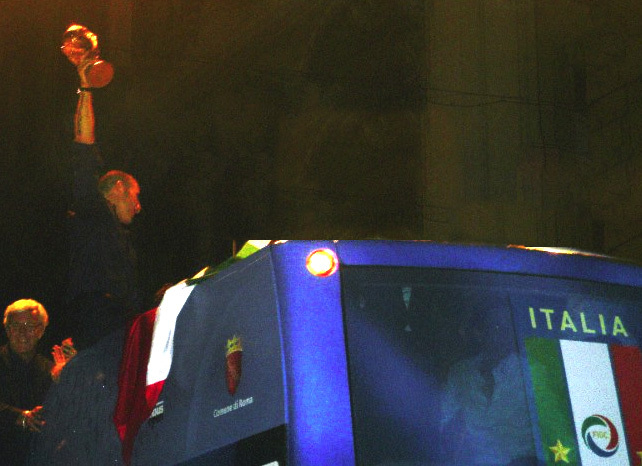 In fact, I was fortunate enough to watch Italy win the 2006 World Cup in Italy, if you can imagine. I watched the final in front of a massive screen on the streets of Avellino. When the last penalty went in and the blessed Azzurri were proclaimed world champions, I was embraced by hundreds of euphoric fans. What followed was an incredible, jubilant, yet peaceful celebration in the quaint little avenues of the small Italian town. My experience was topped off when I reached Rome, just in time to witness the conquering team arrive on a bus to the centre of the city. The chanting was hypnotic and the atmosphere was intoxicating. What an unforgettable phenomenon I witnessed that night! You see, the biggest patriotic act that most people engage in is cheering on their team during the World Cup. It reaches people who have no interest in football otherwise. It touches them at a profound level because it is their country and their people being represented in the eyes of the rest of the world. That’s my country! The power of national representation is, by no means, unique to football. 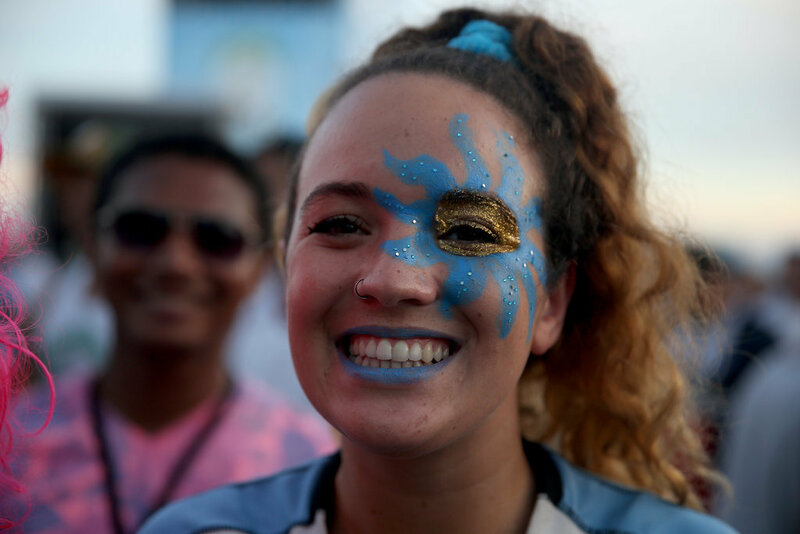 But the World Cup manages to elicit a more passionate, fervent and almost religious-like following from more fans around the planet than any other event, including the Olympics. The tournament has a way of enabling citizens to puff out their chest; of giving them license to say this is our team and having great pride in their nation, and no other sporting event does that because no other sport truly embraces so many people from every corner of the globe. It is the ultimate economic equalizer. It is enjoyed in the poorest as well as the richest nations on the planet. It removes all obstacles and boundaries. Case in point, legends like Pele and Maradona used football to escape abject poverty. Magnates have built vast empires on the power of its fanaticism. 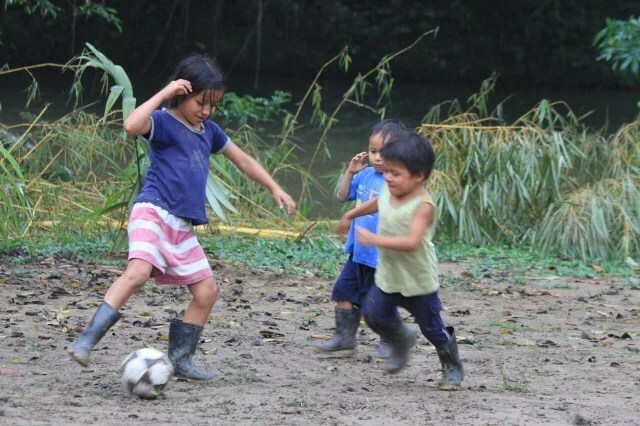 The beautiful game is talked about in the most desolate favelas of Brazil just as it is in the wealthiest lunch rooms of Wall Street in New York. So why have so many people embraced this sport? There are several reasons, but here is the key one: it is the simplest and therefore most accessible game to play. No need for special equipment or confusing rules. Simply kick the ball. 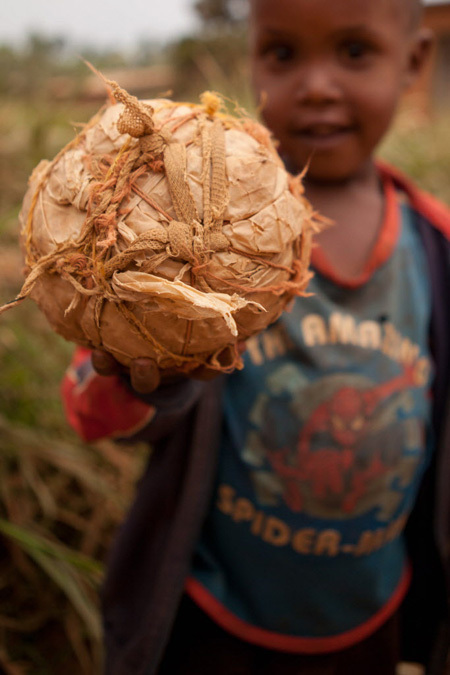 You can use tin can, a coconut, rolled up sock, I used to play with tennis ball before my parents bought me my own shiny new football. Find a couple of shirts or jackets, or anything for that matter, as posts, a couple of friends and you have a game. You can play anywhere – on grass, on pavement, in the school or office hall, in the rain, mud or snow, indoors or outdoors, on the beach. This, by the way, is a distinct indulgence for me – sun shining, bathing trunks, BBQ going, drinks in the cooler and kicking around a size 3 football in the warm sand with your friends. I bet this is what heaven is like. 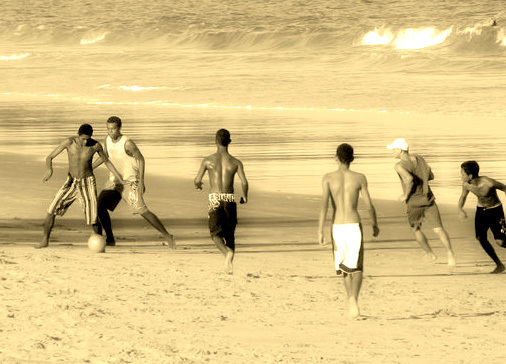 In fact, when people walk by on the beach, the best ice breaker is to pass them a football – 99 times out of 100, they will smile and pass it back, they may even join. You just made a friend. Next time you are wondering why planet earth suddenly stops spinning for a month, every four years, you’ll know why. It’s simply the magic of the beautiful game. This entry was posted in Writers On A Limb and tagged 2014, ball, beautiful game, Brazil, celebration, colors, FIFA, flags, Football, global, nations, passion, planet, players, playing, Rio, Soccer, sports, stadium, travel, why does the world cup matter, World Cup, worldwide by mauriwrites. Bookmark the permalink. Some years ago I met up with a friend who had been in Africa. I was amazed to hear about a small African village he had been to, where there was a Manchester United supporters club.